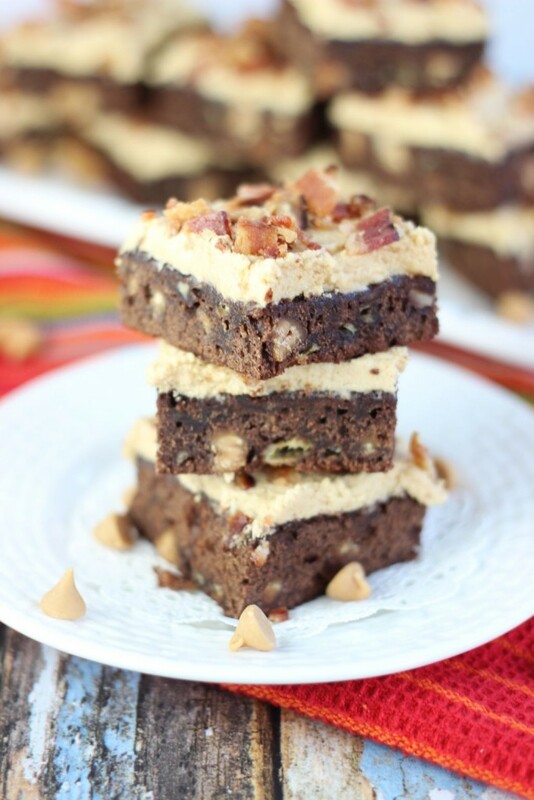 Banana brownies with peanut butter chips, peanut butter frosting, and crumbled, fried bacon! 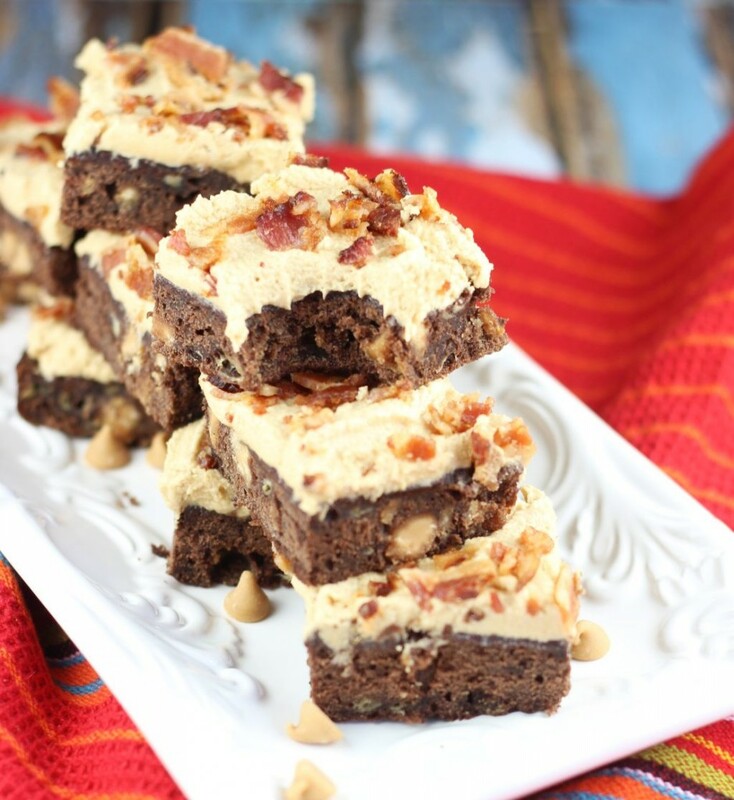 There is no way you can resist these Elvis Brownies! 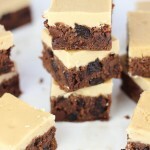 The combo of flavors in these Elvis Brownies is unmatched!! Is there anything that bacon can’t be paired with these days? I think was always pretty popular, but it’s really experienced a resurgence in the last few years. It’s certainly a trendy food at the moment. Who’d have thought? It’s just so salty and greasy though that it’s hard not to love. Everybody craves a good fat-laden, sodium bomb now and again. It also offers some protein, so if you’re strictly nutritionally-minded, at least there’s that. 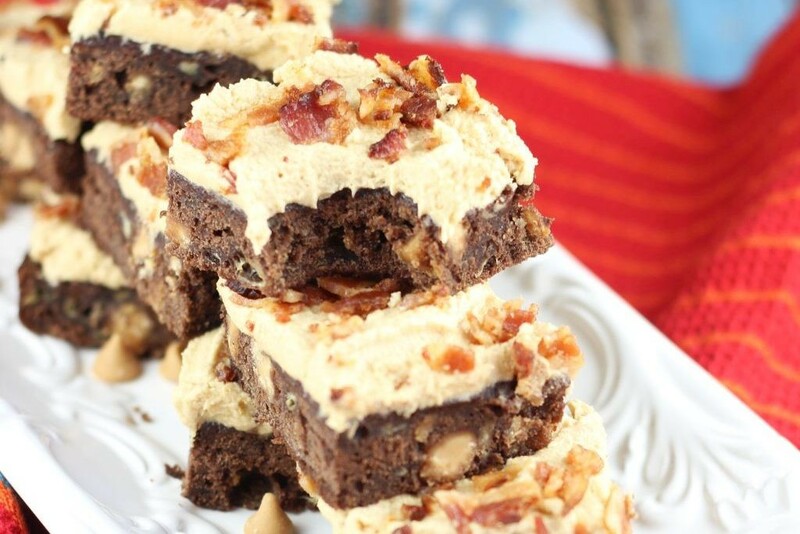 These Elvis Brownies not only combine peanut butter and bacon, a surprisingly awesome duo, but they also include banana and chocolate. 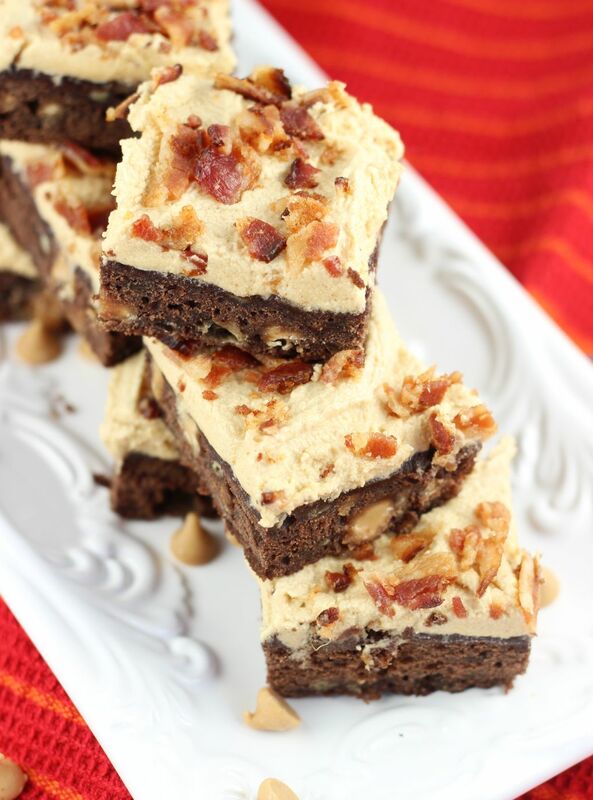 There’s a little bit of everything in these Elvis Brownies. Because, why stop at just peanut butter and bacon, I always say. The brownies themselves are actually lightened a bit by substituting mashed banana for some of the oil. Combining chocolate and banana is delicious anyway, and you shave off a few calories too. 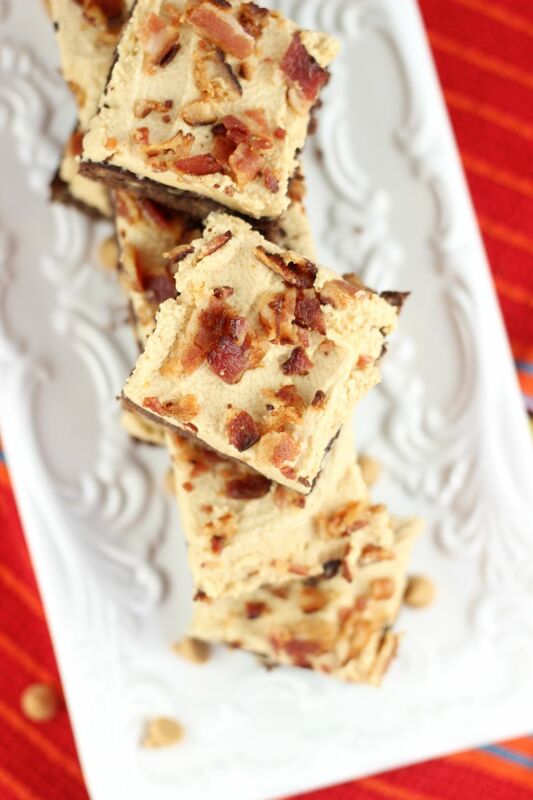 That will be handy when we top these Elvis Brownies with fried bacon. 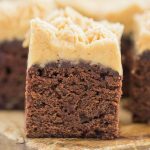 Throw some peanut butter chips in with the brownie batter, and you’ve got a moist and delicious banana brownie with melty and gooey peanut butter chips. Whoop! Next up, slather them with Peanut Butter Frosting. Peanut Butter Buttercream is my favorite. It’s surprisingly fluffy and light for having so much heavy peanut butter, but it really is a fluffy frosting. The peanut butter flavor is intense, and that’s just how you want it to be! 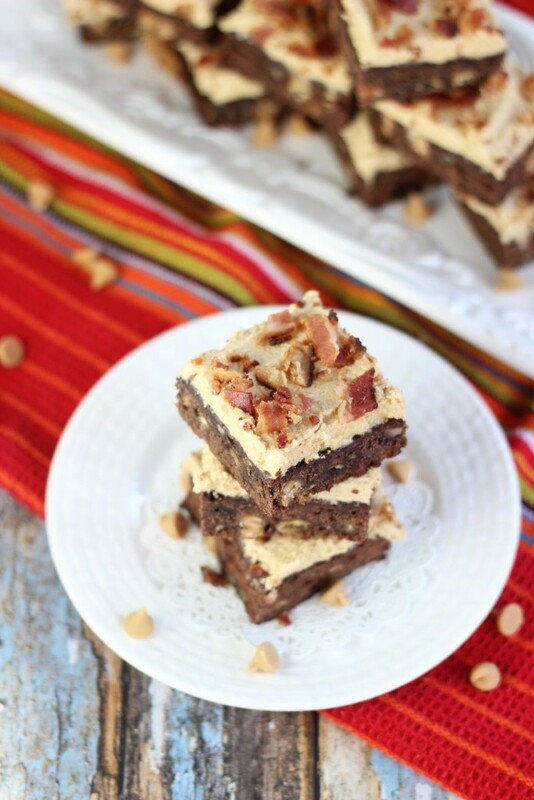 Now, crumble the brownies with a hefty dose of fried, crispy bacon. Are you still with me? We’ve built a circle of trust by now, right? You know I wouldn’t lead you astray. Trust me.. the bacon makes these! 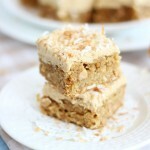 These banana brownies with peanut butter frosting are decadent, no doubt about it. Add salty fried bacon on top for a little salty crunch, and these Elvis Brownies are seriously the ultimate in decadence! Even if you don’t like Elvis’ music for some reason, he definitely got this flavor combo right! 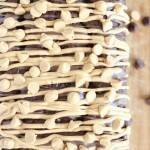 You’ve gotta try this banana brownies with peanut butter frosting recipe. For more peanut butter recipes, especially with peanut butter frosting, I garnished this Nutter Butter Peanut Butter Pie with it, as well as this White Chocolate Peanut Butter Blondie Cheesecake. And I piped peanut butter frosting onto these Peanut Butter & Jelly Cupcakes, these Peanut Butter Cup Brownie Cups, and this Ultimate Chocolate Peanut Butter Torte. 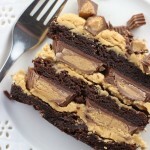 I also slathered it between layers of this Peanut Butter Cup Brownie Torte and this Peanut Butter & Jelly Torte. These brownies look amazing! I love that PB and banana combo with the chocolate 🙂 Pinning! Very creative and fun! We come from a long line of Elvis fans so this is the perfect treat for a family gathering! Thanks! That’s awesome!! So glad you like the recipe! yum! perfect name for these beautiful brownies. Oh my gosh these look amazing, what a wonderful mix of flavors!! Stop it, these look SO unbelieveable!! I need to try them ASAP! 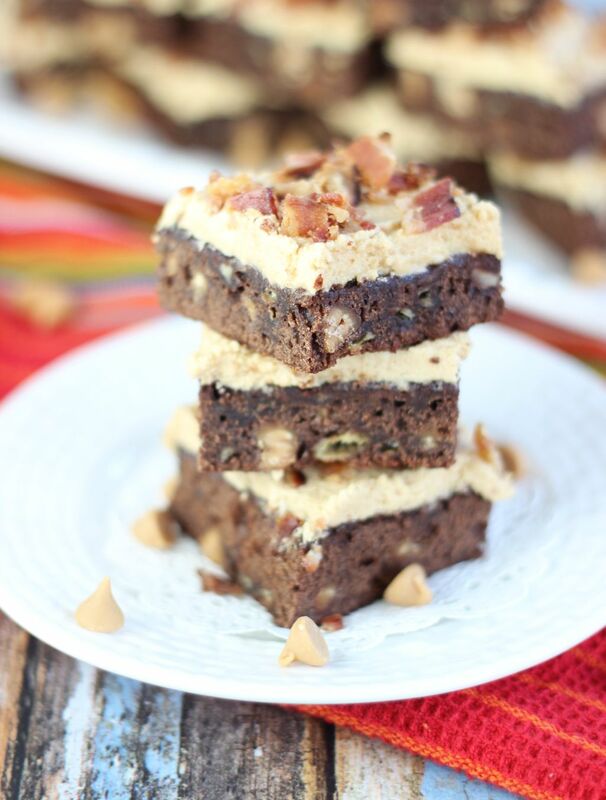 Oh my, bacon and brownies and bananas and peanut butter and… oh my! Thanks for sharing your post on Creative K Kids Tasty Tuesdays. Hi Sarah, I’d love to try this sometime but, I probably would sub the frosting. Although it sounds amazing my family doesn’t like peanut butter & bacon. Go figure. Thanks for sharing at the Inspiration Spotlight party. Pinned & shared.